There are a lot of companies that will rent you a vehicle, but not all of them are created equal. If you are looking to rent a vehicle, it helps to know the pros and cons before you commit. Headquartered outside of St. Louis, Missouri, Enterprise has one of the largest fleets of rental cars in the country and many international locations. In 2008, they also started a carsharing service, which allows drivers the short-term use of vehicles that include hybrid and electric models. They also sell used cars to consumers. 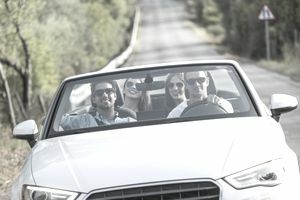 If you are looking to rent a car for a short period of time, such as one day or even a few hours, Enterprise often offers the lowest rates of anyone. Enterprise is everywhere. They have over 6,000 U.S. locations and several international locations. They will pick you up for free from your hotel or even home (though not from the airport) and take you to the rental office. Most places charge $35 per day for a young driver, aged 21-24. At Enterprise, you will only pay $20 per day. If you’re renting for more than a month, you will get a slight discount through their Month or More plan. Another pro? No hidden fees. Although their daily rate might seem slightly higher than other companies at first glance, they save you a lot by not taking on additional hidden fees. Enterprise has a loyalty reward program, Enterprise Plus, which allows you to earn points for the money you spend on rentals. You will also get expedited in-store service, making your rental pickup and return process much easier. After six rentals, you will earn an additional 10 percent and will get one free car upgrade per year. Up the ante to 12 rentals and you will get 2 free upgrades per year, and 24 rentals will net you four yearly upgrades. You can transfer your points to other friends or family members if they are also Enterprise Plus members. Enterprise, as a whole, is known to have great customer service. If you have a special event, Enterprise rents exotic vehicles in addition to their more traditional offerings. They also offer hybrid vehicles, which are great if you are trying to be green. If you need to drive around a group of 15, they have got passenger vans, too. If you are looking to rent a car for a week or more, you might find better deals elsewhere. If you are looking to add an additional driver, you will pay $12 per day. This is about the industry average, but it is an extra cost. Enterprise Plus is not particularly generous with their rewards. You can only earn up to 400 points a day, which is pretty low compared to other rewards programs. You also can’t earn any reward points if you book your rental through a third party. The Better Business Bureau, which ranks businesses based on their customer service and whether or not they adequately respond to customer complaints, has given several Enterprise locations an “F” for failing to respond to complaints. Many locations have better ratings, but it’s worth checking out the particular location you want to rent from before you commit to them. Book as far in advance as you can. If you book the night before, you will definitely pay more for your rental than you otherwise would. Try to book away from the airport. Enterprise has many locations that are away from the airport area, and you will save a lot in rental fees by avoiding this saturated marketplace. Check whether or not you actually need the insurance. Enterprise will definitely try to sell it to you, but that does not mean you need it. Often, your regular car insurance policy will cover you, and if you booked through a credit card, they usually offer protections, too. If you are looking to rent for a very short or long period of time or looking to rent a car in a suburban or rural area, Enterprise is probably your best bet. However, if you are renting for a few days or around a week, it is worth checking out some other options. No matter the duration of your rental, check the rates at a few different places before you commit.